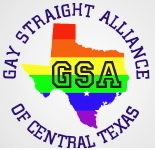 Hosted by the GSA of Central Texas, Inlaws & Outlaws will screen at the Central Texas College in Killeen on October 11th. This showing will form part of Inlaws & Outlaws' celebration of National Coming Out Day 2007 on October 11th. It also forms part of a group of screenings that bring Inlaws & Outlaws to the state of Texas for the first time.